A year of roasting out of Buitenverwachting is behind us. This newsletter is mainly about landed and anticipated coffees. In the last 6 weeks we have been assessing a number of new harvests, and some other offerings we have had. We finally got our Yirgacheffe, which we ordered November last year through Kiama. Kiama found us the Kenyan coffees we do, which we are happy with. The Yirgacheffe comes from a processing plant in the Yirgacheffe town of Ethiopia. Even though it costs us a little more than the previous Yirgacheffe, which we got from a bulk importer, we have kept our price the same. The coffee has that distinct Lemon and reminds us of the Yirgacheffe of old. Most Ethiopian coffees are actually sourced through the Ethiopian Coffee Exchange and there have been rumours for a while that are they are watering down the classic coffees like Limu and Yirgacheffe with other coffees. We have suspected that the Yirgacheffe was not quite Lemony enough for a few years and hence where excited to get involved with Kiama in sourcing Yirgacheffe from Yirgacheffe. You can read more about Yirgacheffe here: yirgacheffe.co.za. We have also secured three additional coffees from Café Imports, who are American based agents that work direct with the coffee farms buying lots that they like. We have learnt from experience that we can get great coffees from agents like these and they end up being a reasonable price. When we have gone direct to the farms the transport cost has represented up to 40% of the coffee landed price. So some of the farmers are now referring us to these types of agents. This is a coffee from about 350 small-holding farmers, that are part of the Highland Coffee Presidium Slow Food consortium. The coffee is balanced, juicy and tangy with chocolate, cranberry and lime. The Limited Edition Cup of Excellence winner we are selling, is from the same Huehuetenango region of Guatemala. We selected this coffee from 4 other Guatemalans we tasted. We must admit that we have been bursting to do a Yellow Bourbon. The Bourbon varietal is named after the Bourbon Island, where the horticulturists developed it by letting an Arabica typica plant pollinate itself. This varietal of Arabica is very popular in South America, and it has a two sub species that produce a yellow and orange cherry when ripe rather that the classic red cherry. We first heard about these varietals in 2008, and have not been able to source any yet. When we got our samples from Café Imports (which we taste blind, not knowing their origin at all), the Yellow Bourbon stood out without us even knowing that, that was what we were tasting. 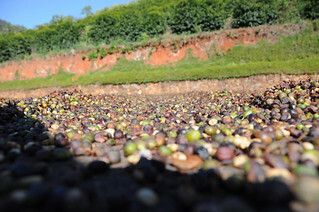 The pulped natural process means that the coffee is dried on the cherry and then either de-pulped manually or semi automatically using a depulper. The result is when it is done properly there is a distinct body to the coffee, and strong fruit. In this case the coffee is citric and heavy with fruit tones. As much as we believe there is a place for the Fairtrade and organic movement, we try purchase as many coffees in a way that the farmer benefits most. We want to be the change we would like all to adopt. It is for this reason that our packaging is fully recyclable and locally made. Last year we imported 2 Mexican coffees and they were very popular. This year after tasting a few we selected the one from the El Triunfo Biosphere reserve, not knowing that this coffee is a Fairtrade and organic certified coffee, so that is a bonus. The coffee is rich, with caramel, raisin and sage, and we loved it. If you are a regular visitor to coffee.quaffee.co.za, you will see a few new coffees, and some are gone. Some have sold out, but we have also removed 2 regulars Excelso and Sul da Minas. We have remvoed these two since we have decided the quality of these products is unpredictable and since we only sell what we can drink we have removed these coffees. We have added and good El Salvador (which we are receiving positive feedback) and the Nicaraguan Tesoro is doing well too. We participated in the Mexican Cup of Excellence auction partnering with an Australian and South American company trying to win lot 15. The cost of the auction is USD1 per pound, and then the actually price of the coffee is what the farmer gets. We will only get this coffee near the end of the year, and will release it under our limited edition range. Once we know all the costs on this coffee, we will be posting all of the costs on our blog, and will welcome any comments on how much people believe we should sell it for. There are a number of new machines in the Jura range, you can view an updated summary here: http://jura.quaffee.co.za. There is also a special where the Baby Jura Ena1 is now coming free with its own standalone frother. Not a bad offer for those that drink no more than 5 cups a day at home. Previous Drinkability rating, how do you rate your coffee?